To go along with our book, we made an ocean picture with "ten little fish". 1. Tear up some blue tissue paper. 2. Lightly spray a piece of white construction paper with water. 3. Stick the tissue paper pieces to the wet paper. Allow it to dry. 4. After the paper is dry, peel off the tissue paper. 5. Add some fish cut out of construction paper. 6. The fish in the book were all different colors, but Madelyn wanted all orange fish! 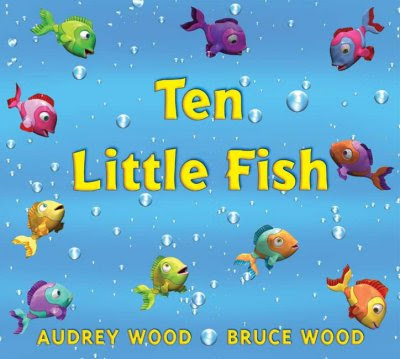 Ten Little Fish is one of our favorite books. Cute project - we'll have to try that. I love this idea! I haven't tried using wet tissue paper to leave prints. I've added it to my list of things to try! We all love "10 Little Fish"! I love the tissue paper idea. I love how you used the tissue paper. We'll have to give that a try! So cute! I put my activity up for kids corner. I writing all this down -- now I have so many great activities to do with Aden. I love this story. The fish are adorable in it. Your water was a new creation for me--thanks. That is adorable and a clever idea! oh my gosh! i am totally bookmarking your blog. love all the cute ideas! What a cute idea! I'll have to try that! Thank you for stopping by my blog yesterday! Thanks for the warm welcome and stopping by my blog to say hello!